An independent life cycle assessment conducted by Edge Environment research company has demonstrated that Re>Pal pallets have the lowest environmental impact when compared with functionally equivalent pallet alternatives. Here are the highlight facts from the study. – Jonas Bengtsson, CHIEF EXECUTIVE EDGE ENVIRONMENT. Here are the highlight facts from the study. >Re>Pal uses less energy for manufacture than other pallet types, and has the lowest embodied impact raw material feedstock. >When use and durability are taken into account, Re>Pal surpasses conventional pallets in all assessed environmental indicators due to their lower replacement needs, lighter weight and lower emission during production. >Re>Pal pallets are almost waste neutral, meaning they use almost as much waste during manufacture as the waste that is produced throughout their life cycle. This includes transport and end of life (EOL) disposal. >At the factory gate, Re>Pal pallets have a lower carbon footprint than timber and plastic pallets softwood pallets have a far lower life than Re>Pal pallets. >Although the results are sensitive to the nature of the supply chain, Re>Pal pallets will have a lower environmental impact than other pallets under equal circumstances. At Re>Pal we are striving towards a world of zero waste – and by using Re>Pal pallets, your business can help us work towards that goal. 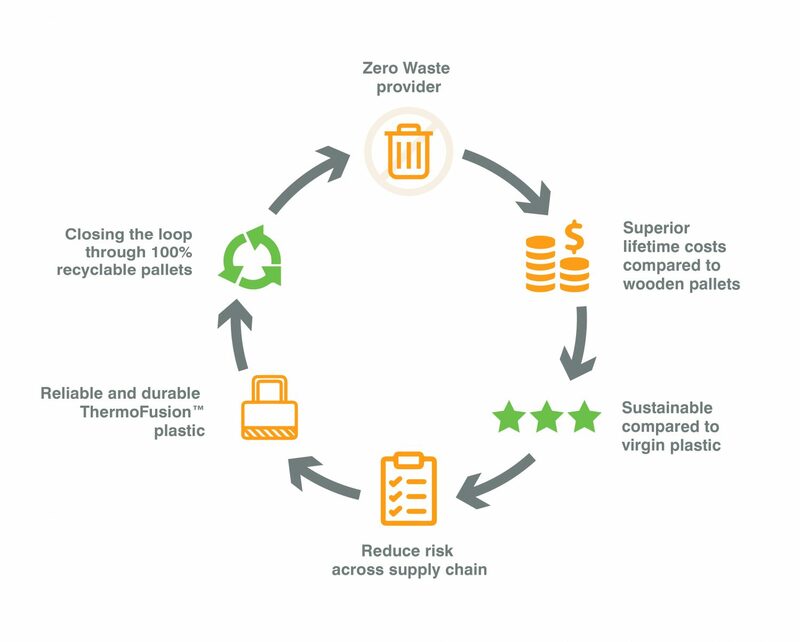 Re>Pal’s patented and advanced process of ThermoFusion™ is able to create a malleable dough out of salvaged mixed waste plastic. The process avoids the costly process of grading and sorting the waste material, does not require the production of virgin plastic, and forms an innovative and sustainable way of taking care of waste plastic that would otherwise be polluting our river-ways, oceans and land. Our compressed, moulded pallets are ISO8611 tested to fully meet your supply chain needs, meaning you are not only making great inroads towards a zero waste future, you’re doing it in a sustainable way that will have only benefits in the running of your business. Wooden pallets require fumigation or heat treatment to cross international borders, may attract customs inspections which can mean additional cost, delays and risks to your business. Wood pallets also degrade far faster than plastic pallets, pose health and spoiling risks to your cargo due to splinters, nails, insects, fungi and bacteria. In contrast, Re>Pal ThermoFusion™ pallets do not absorb moisture, are resistant to fungi and infestation and are easily cleaned and inspected. Re>Pal’s pallet design standards are also future proofed to enable our pallets to be easily fitted with RFID devices should clients require. Re>Pal pallets are more robust than wood and will have a 10 times or more lifespan than wood depending on the application. Some wooden pallets will only be able to handle 10 or 20 touch points whereas Re>Pal’s pallets will easily out-perform wood leading to a lower lifetime replacement cost and therefore higher lifetime value for our clients. Plastic pallets also greatly reduce your risk of dock inspection, are more visually appealing, and can be transferred from product to product with no risk of cross contamination to your cargo. Re>Pal also has many designs available for clients including a space-saving nestable design which is also economical to distribute, requiring only one-third of the space required by wooden pallets. From a sustainability viewpoint, recycled mixed waste plastic pallets offer a zero-waste, low carbon, more sustainable and easier recyclable alternative to wood. Pallet use in some areas is devastating forests, and can account for up to a staggering 40 per cent of timber production in some regions. Additionally, in certain markets it is hard to guarantee that any wood provided has been sustainably sourced. Recycled mixed waste plastic is also completely recyclable when pallets eventually need replacing as it can be used as a feedstock for our process.